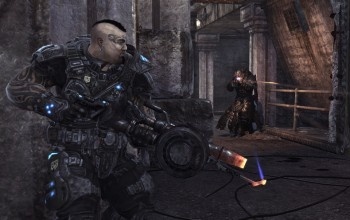 Epic Games is considering a major update to the Gears of War 2 ranking system that would change the current "TrueSkill" scheme to an experience-based system similar to that used in RPGs. Epic Senior Producer Rod Fergusson said in a message posted on the Gears of War forums that the studio is considering a drastic overhaul to the ranking system that would award "experience" for participation in matches in order to more accurately reflect a player's skill and accomplishments. Fergusson said the potential changes are fueled by longstanding frustration with the current system, which rates players based on match results rather than individual performances. "You would gain experience through your individual performance in Public multiplayer matches - the higher your score at the end, the more experience you acquire," Fergusson wrote. "Of course the experience gained across the different match types would be balanced so you couldn't just grind on the respawning game types to try and level faster. The experience requirements for each level would grow with each level gained (like a typical RPG) and we'd have 99 levels of experience for you to show off your 'leetness.'" Players would almost always see progress toward level advancement, he said, because score and experience will be awarded with every match. The only exception would be for players who quit in the middle of a match, which would incur an experience penalty that could actually cause a demotion. He also suggested that if implemented, the new system could lead to further changes down the road. "Since I know what one of the first questions is going to be, initially we wouldn't have achievements for gaining experience levels because of Xbox Live rules that require all post release achievements to be tied to new DLC content," he added. "But when new DLC is released, it's a whole new ball game then." There's no word yet on when Epic plans to put the new ranking system in place, if it goes ahead at all, but feedback to the idea has been coming fast and furious on the Gears forum, both for and against the idea. It's obvious that people on both sides of the argument take the game, and their ranking, very seriously.